In church yesterday we sang Chris Tomlin's "How Great is our God." Every time I hear or sing that song the chorus really grabs my attention. 'Sing with me...and all will see'...that's the part that gets me. You see, I know our God is great. People in churches all around the world know that God is great. But what about all the people not in church? The people who have no desire to ever enter a church? Do they know God is great? And if they don't, how will they ever see His greatness? According to this chorus, it will only happen if we who know God can 'sing' together. That may sound like a very superficial answer, but it isn't really. Tomlin doesn't mean our voices must be in tune with each other, or that we know the song well enough not to fumble the lyrics. That would be too easy, too superficial. Tomlin means our lives must be in tune with each other. We have to be singing the same song, and that's no easy feat. Think about it. Just within one local church there are often divisions over issues like music styles or what is considered proper attire or even which translation of the Bible the pastor should use. Magnify that over all the churches within a denomination, then all the different denominations. That's a lot of differences in opinion. Then, of course, there are the differences between denominations. Some are rather small differences, others full-out, bloody war. Can you see how the people of the world can miss the wonder of God's greatness when we Christians are the only demonstration they see? Does Tomlin have biblical basis for this chorus that so affects me? Turns out, he does. In John's gospel, chapter 17, Jesus prays for all those who will one day believe in Him. He prays, "that all of them may be one, Father, just as you are in me and I am in you. May they also be in us so that the world may believe that you have sent me. I have given them the glory that you gave me, that they may be one as we are one: I in them and you in me. May they be brought to complete unity to let the world know that you sent me and have loved them even as you have loved me" (John 17: 21-23). That hardly describes Christians in the world today, or any other era of church history. 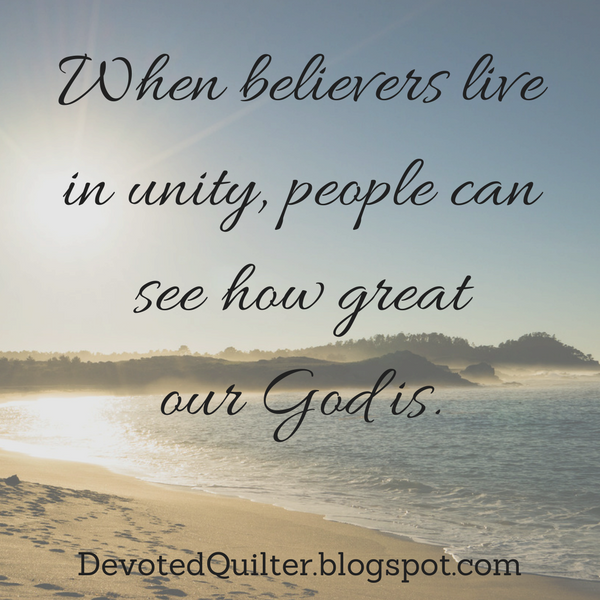 And yet, if we were to live in unity with one another, to sing the same song as it were, then the world would see and know that God sent Jesus. And knowing that would change them for eternity. So how does that mean we should live? Do we ignore our differences, or pretend everything is perfect? Of course not. But there is a world of difference between disagreeing with someone and bad-mouthing them to anyone who will listen. Paul wrote, "If it is possible, as far as it depends on you, live at peace with everyone" (Romans 12:18). That should be our guiding principle in every relationship we have. Not to make ourselves doormats, but also not to try to take advantage of others. To not take offense easily or to hold grudges. To forgive as readily as God has forgiven us, which I know is easier said than done. As for the differences between denominations, I think it is important for each of us as believers to read the Bible for ourselves and know what we believe, but not to attack others who interpret certain passages differently. The Bible is full of hard to understand passages that have been debated for centuries with no resolution. What good do we do if we hate one another over these differences? Jesus said, "This is my command: Love each other" (John 15:17). If we could obey that command, doing our best to live in peace with everyone around us, then I think the world would sit up and take notice. They would see something worth further investigation. They would want to know why we are different. And that would give us the opportunity to tell them about the God we serve, who loves them so much He sent Jesus for them. And then they would see how great He is. Thank you for today's post, and yes I to like "How Great is Our God". Great post! I love this song but honestly, I never saw the whole unity thing in it before. Thanks for sharing.